ANDY MCNABB's quiet confidence and ready smile is the first thing that strikes you when you meet him. McNabb is excited by the unique potential in every individual and firmly believes that his role is to create an environment that encourages people to express themselves and to work with each other to achieve the objectives of both the business and its clients. McNabb is CEO of the Daly Credit Corporation which specialises in consumer credit debt collections and recoveries. This business was started in 2001 by him and his now retired partner Bill Daly with less than 30 employees and a single client. McNabb recalls that it was a big decision for both of them to leave the comfort of their legal practices and the firm that they had co-founded in 1982. He says that neither of them had any knowledge of or experience in call centre technology or in the management of consumer credit collections when they started the company. They were motivated by a compelling belief in the future of legal call centre collections due to the growth of consumer credit debt. "Consumer credit really took off back in the mid-1990s when South Africa moved from being a 'cash save' to a 'credit spend' society and when the banks and other financial institutions came under pressure to 'bank' the previously 'unbanked'," McNabb explains. "This gave rise to the micro-lending industry and retail consumer credit on a massive scale." He adds that credit was seen as a way to help average South Africans improve their living standards but the dark side of credit (debt) soon resulted in over 10 million consumers becoming over indebted. And so, the Daly Credit Corporation was born. McNabb says that the past 18-years have been tumultuous with many high and low points. There have however been five driving forces that have carried him through the years and still resonate with him today - belief, team work, culture, fear and luck! "Bill and I started the business with a belief - belief in the value of our services and belief in our ability to become a credible player in debt collections. This belief was also shared by our clients, especially those who took a chance on us when we were new to the industry. I know now that when a business believes in what it is doing - and has the support of its people - it can overcome whatever obstacles come its way. It will be successful." McNabb counts himself as fortunate to have worked with some really great people - people who have understood the interdependency of everyone in the business and who have contributed their best to company's success. "Our people understand that if the business succeeds, they succeed. As we have grown, these people have shared in our success. This is an essential part of leadership - to recognise people when they truly deserve it. In this way we have not only developed and retained our top people, we have given them a place at the boardroom table." The premise that it takes the absolute support of people to move the business forward is a key reason that McNabb places a major emphasis on culture. Daly Credit Corporation is a family business and McNabb is particularly proud to have two of his sons working with him. Combined with his people orientation, it's no surprise the company's culture, the "Daly Way", is based on family values. "Our culture is about recognising that we are people," he explains. "We value love, discipline, respect and a never say die attitude. We're about celebrating each other, recognising and rewarding our achievements - both big and small. We get close to our people so we know each other at a personal level and understand each person's aspirations. 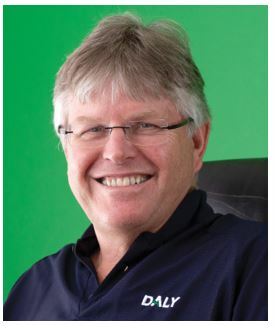 The Daly Way is about connecting as people." And this connection with people defines McNabb's next driver - fear. "The same fear dogs me every day - the fear of failure and the collateral damage that would cause to our employees, their families and their community. This company will continue to evolve and grow because together, we are successful." And finally, McNabb says that success is about luck! "Success is about being agile enough to take advantage of some opportunities and saying no to others. I've seen too many opportunities come my way that can't be explained in any other way except to say that we have been very lucky." And the reason that he has been successful? "Perhaps the reason is my persistence in staying the course and my inquisitiveness of discovering my true potential. Over the years I have participated in a number of endurance events including five Comrades marathons, 12 Dusi and Fish River canoe marathons and eight Sani2C mountain bike races. I love the adrenaline of taking on the unknown and the element of risk and luck. I have also been fortunate to trek with my family to Everest base camp in Nepal and to Machu Picchu in Peru." "I believe that in business and in life you make your own luck - it's about networking, it's about being a leader in an industry, it's about weathering the storms that come your way. But most of all, it's about having the right people around you."